Me and my husband when for a scan 3 days ago as my doctor thought I had an ectopic pregnancy. 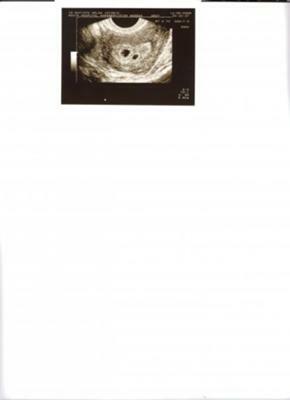 We found out that we are having twins..
At the moment I'm very scared as I keep thinking I'm gonna have the "vanish twin syndrome". I'm so happy that we're gonna have twins that I can't believe it's happening with me...!!! Just hope all goes well. Comments for 5 Weeks - Two Sacks...Twins! Okay, so this kinda makes me nervous. I went in when I was only 4w 3d, thinking I was having an eptopic, from the horrible pains in my lower abdomen. I had a trans-vag u/s done. They couldn't find anything. two days later my HCG levels had almost tripled. They found a sac on the u/s .. it was still small to see, and she had to zoom in for measurements and a picture. But in the zoomed in one, I have the sac, and then directly to the right there is a smaller sac, thats exactly identical to the bigger one. I dunno if its twins though, cause she only saw one when she wasdoing the u/s cause it was with the wand. She just wanted to confirm. I hope im lucky like you. My bf wants twins, hes in afghanistan right now. omg i know this might sound weird but the same thing happened2me i was told in the er i had an ectopic preg when they did surgery they said nothing was there i found outExactly @6wks5dys i had twins i thout of it as a blessing &by the way my name is also vanessa!Congrats & good luck w/your pregnancy hope all goes well please pray for all women carrying twins!